Many of us shy away from eating dried pasta on backpacking trips because it takes so long to cook and uses too much stove fuel. But did you know that you don’t have boil dried pasta using the amount of water recommended on the package or for the entire boil time? Simply cover your noodles with water, bring the water to a boil, give your noodles a stir, and then turn off the heat (keeping the pot covered) Full stop. Your pasta will cook in the same amount of time and to the same texture as it would have if it cooked at a full boil. You can save a lot of fuel this way and enjoy your favorite spaghetti noodles or shapes. 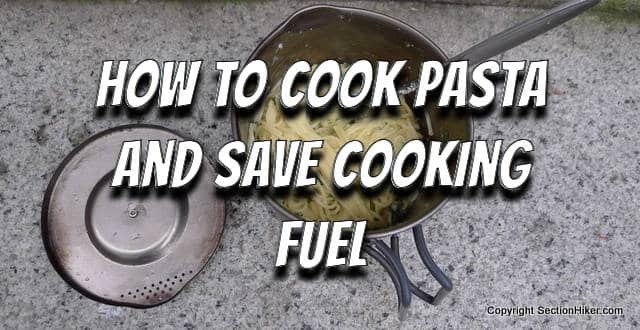 It also means that you don’t need a simmering capable stove to cook plain pasta and that bringing a pot cozy is probably a better investment than carrying more fuel. Make a pot cozy or buy one to keep the hot water warm while your pasta soaks. If you have a small pot and want to cook spaghetti, break the noodles in halves or thirds so they’ll fit in your cook pot. Save the pasta water that’s left over after your pasta has cooked. It makes a very good base for rehydrating pasta sauce and the starch in the water helps keep the sauce on your noodles. Not using sauce? Drink the water for the added calories. You don’t need to drain the water out of the pot when you cook pasta, it’s perfectly ok to pick it out of the pot with a fork. You don’t need to add olive oil to your pasta to keep it from sticking together. It actually makes it harder to keep the sauce on your pasta because it slips off. You don’t need to add salt to your water to raise the boiling point of the water, so your pasta cooks faster. In reality, you would need to add 230 grams (0.5 lbs) of table salt to a liter of water just to raise the boiling point by 2 degrees celsius, more than anyone could tolerate. This is the buy far the easiest way to do pasta. I dehydrate my homemade sauce, and the use angel hair pasta. I use a kettle to boil the water then just pour it on the mix in my bowl, set the covered in my cozy, and do something else for a bit. Sometimes you can find some pasta shapes in quick cook varieties at the grocery store making this method even more feasible. Pretty handy tips there! Having worked in various commercial kitchens over the years, one of the things to always keep in mind is that the momentum of cooking does indeed continue beyond the time the burner is turned off. The larger the pot of food, the longer the food would continue to cook. It’s easy to produce overcooked pots of glop by not taking this into account. Starting with thinner noodles moves the finish line even closer. The book time for capellini — which is a fraction of the diameter of spaghetti — is three minutes. About the same for the thin rice noodles. The instructions on the rice noodle package even say bring the water to a boil, add the pasta, then turn off the heat and wait three to five minutes. Longer-cooking things like lentils or rice can be pre-soaked in a container for the day while hiking to dramatically reduce cooking time. My Sicilian mom (RIP) would have chased you out of the kitchen with a wooden spoon for suggesting not salting pasta cooking water. The salt is really more about adding flavor to the pasta — which actually incorporates some of the salt while cooking — rather than speeding cooking time. 1) you can also cold soak pasta in cold water to reduce the cook time. At high altitude, water boils at a lower temperature. At 10,000 feet (common in Colorado), water boils at 193°F, a good 20 degrees cooler than sea level! This is probably why dehydrated meals require extra hydration time at high altitude (like twice as long). If adding salt could raise the water temperature, that would be a plus. But I think, as Phililp notes, it would take a lot of salt! If you have a home dehydrator you can cook the pasta (or rice) and then dehydrate it along with the sauce and other ingredients. On the trail you just boil your water, add the dehydrated pasta/rice meal, and let it sit covered for 15-20 minutes with an occasional stir.